What could possibly be in my air duct system and why would I need to have my system cleaned? Human skin scale and dander, insect & rodent feces and remains, allergens, dust mites, construction debris, pet hair and dander. Your family may be inhaling these contaminants every time your heating and cooling system turns on. If other people have lived in your home before you, you may also be breathing in these same contaminants that came from them. You may also need to have your system cleaned if you are getting a new furnace, have smokers in your home, have pets, recently remodeled, or haven't had your system cleaned in at least 3 years. How do I know if my air duct system needs to be cleaned? There are different methods of detecting if the system needs cleaning. Look on your furnace for a sticker from an air duct cleaning company. Most will have stickers they apply to your furnace upon completion of a cleaning to indicate when it was last done. If it has been 3 years or more, it may need to be cleaned again. Another method is to open a vent from any room in the house and shine a flashlight in it and use a mirror to see down the duct; if you see a film of dust/debris then it's time to clean your system. When you change your filter does is re-accumulate with dirt and debris at a more rapid pace than normal to your system in the past? If so this is an indication that your system is dirty. Finally, when the system is running does debris come out of vents? That would also be an indication that it's time to get your system cleaned. My home is brand new, I don't need my air ducts cleaned, do I? White or grey dust on surfaces and electronics. Insulation and debris coming out of vents. Floor vents with construction debris in them. I thought pollution was outside. Why should I be worried about my air indoors at home or at work? You may be surprised to learn about the health problems and resulting quality of life concerns that are affected by what you breathe into your body. The EPA has determined that the air in your home or commercial building (work) is often 60-70% more polluted than the outdoors. We spend 60-90% of our time every day indoors between home and work. Plus, today's efficient, airtight homes and commercial buildings are excellent at conserving energy, but that also makes them better at trapping potentially irritating particles inside. With the rising number of people who suffer from allergies and asthma, indoor air quality has become more and more important to our general health and well-being. Yes. Consider that the average home generates 40 pounds of dust for every 1500 square feet of space. Although you may vacuum on a regular basis and even contact vacuum in your registers, there is still so much of your system that is not clean and every time your system turns on, what remains may enter your clean living space. Just think about how often you change your vacuum bag or empty your canister after vacuuming your floors. This same dirt and debris also drops down your vents as well, however it accumulates through your system and eventually it needs to be "emptied" as well. What steps can I take to minimize the dust and have the cleanest indoor air possible? Thorough dusting of all surfaces and moping of all hard floors. Clean all bed linens and contact vacuum or have window treatments cleaned. Have your furnace and air ducts cleaned and install a new filter upon completion of cleaning. Have your carpets and upholstery professionally cleaned. This is what BF Power Vac recommends for anyone who is trying to make the indoor air they breathe as healthy as possible. However, it is nearly impossible to keep dust completely out of your home, as every time you open a door or a window, dust/pollen comes in. We also track it in on our shoes as we enter our homes. Residents with allergies or asthma who might benefit from a reduction in the amount of indoor air pollutants in the home's HVAC system. What is the normal price range for a residential air duct cleaning service? 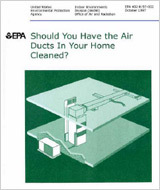 The Environmental Protection Agency says that "duct cleaning services typically – but not always – range in cost from $450 to $1000 per heating and cooling system, depending on the services offered, the size of the system to be cleaned, system accessibility, climactic region, and level of contamination" and type of duct material. Commercial clients are recommended to contact a NADCA Certified Ventilation Inspector (CVI) and/or a NADCA certified cleaning contractor to attain pricing for commercial buildings. Consumers should beware of air duct cleaning companies that making sweeping claims about the health benefits of duct cleaning – such claims are unsubstantiated. Consumers should also beware of "blow-and-go" air duct cleaning companies. These companies often charge a low fee and do a poor job of cleaning the heating and cooling system. These companies may also persuade the consumer into unneeded services with and/or without their permission. Don't jeopardize your family's health by using an inexperienced, unqualified provider. According to the EPA an improper cleaning can actually make indoor air quality worse. Inquire whether the company is in good standing with the local Better Business Bureau. Make sure that the company is going to clean and visually inspect all of the air ducts and related system components to insure cleanliness. Avoid advertisements for "$149 whole house specials" and other sales gimmicks. NADCA Members have signed a Code of Ethics stating they will do everything possible to protect the consumer, and follow NADCA Standards for cleaning to the best of their ability. Air duct cleaning companies must meet stringent requirements to become a NADCA Member. Among those requirements, all NADCA Members must have a certified Air Systems Cleaning Specialist (ASCS) on staff, who has taken and passed the NADCA Certification Examination. Passing the exam demonstrates extensive knowledge in HVAC design and cleaning methodologies. ASCS's are also required to further their industry education by attending seminars in order to maintain their NADCA certification status. The amount of time it takes to clean a residential HVAC system depends on many variables such as the size of the home, the number of systems, the extent of the contamination and the number of HVAC cleaners performing the job. A typical home with 12 vents and a furnace in the garage can take one cleaner 3-6 hours and two cleaners 2½ - 4 hours. Energy savings and your home's Heating & Cooling Systems.